Join us Friday April 5th for a special Friday Night Flight featuring the wines of Côtiere! Owner/winemaker Kevin Law founded Côtiere in 2006. Kevin is committed to making high quality, terroir-specific wines from Burgundy and Bordeaux grape varietals. A native of Santa Barbara, Kevin works with grapes from premier vineyards throughout the Santa Ynez, Santa Maria, and Napa Valleys. David Tonus of Rising Star Wine Group (the distributor for Côtiere in California) will be joining us to share his knowledge of Côtiere and our featured selections from the winery. David has extensive knowledge and experience in wine sales and marketing, as well as a degree in Enology from UC Davis. The tasting will take place from 5pm to 7pm in the Soif wine shop. The cost of attending the tasting is $15 for the general public, and free for Soif wine club members. Tickets may be purchased below, or at the event. We are thrilled to welcome Noelia de Paz, winemaker and founder of La Osa wines, to Soif! After ten years of working at her family’s winery, Bodegas Tampesta, Noelia decided to branch out and start her own project. With the focus of creating expressive, small production, wines from her native DO Tierra de León (located in the south of the province of León in Spain), Noelia began La Osa in 2015. The list of wines being poured for the event will be posted here soon! The tasting will take place from 5pm to 7pm in our wine shop. Cost of admission is $15 for the general public, and free for Soif wine club members. Tickets may be purchased below, or at the event. The tasting will take place in our wine shop from 5pm to 7pm. Cost of admission is $15 for the general public, and free for Soif wine club members. Tickets may be purchased below, or in our wine shop. Further information, including the menu for the evening will be posted soon. Reservations are required, and may be made by calling Soif at 831-423-2020. We are delighted to welcome Andrew Tow, founder of The Withers, to Soif! Join us Thursday, March 7th, for a guided tasting of The Withers wines. The Withers is a new project focusing on high elevation, cool climate sites that yield exceptional, nuanced and balanced red and rose wines drawing from Rhone varietals grown in the Sierra Foothills and Mendocino County, as well as Pinot Noir grown in the Anderson and Green Valleys and the Sonoma Coast. The Withers was founded by Andrew Tow, a longtime collector and advocate of food friendly, understated, lower alcohol yet deeply flavorful wines, and features as its winemaker David Low, co-founder and winemaker at highly acclaimed Anthill Farms Winery. The tasting will take place from 5pm to 7pm in the Soif Wine Shop. Cost of admission is $15 for the general public, free for Soif wine club members. Tickets may be purchased below, or at the event. 2017 Vigna Rada Cannonau di Sardegna "Riviera"
2017 Vigneti Vecchio Etna Rosso "Sciare Vive"
2016 Masseria del Pino Etna Rosso "i nove fratelli"
The tasting will begin promptly at 6:00pm in the Soif wine shop. In addition to the wines being shown, we will be offering a variety of appetizers, prepared to complement the featured wines. Cost of admission is $30 for the general public, $10 for wine club members. Tickets may be purchased below, or at the Soif wine shop. Friday, February 22nd we will be joined by T.J. de Jony, winemaker for Piedra Creek Winery ,for a special Friday Night Flight! Piedra Creek Winery is one of the oldest wineries in the Edna Valley of San Luis Obispo. Since their first vintage in 1984, Piedra Creek has specialized in producing small batches of quality wine. The tasting will take place in the Soif wine shop from 5pm to 7pm. Cost of admission is $15 for the general public, free for Soif wine club members. Tickets may be purchased at the event. We are thrilled to welcome Eric Sothern, sales director of Rhys Vineyards, for a special dinner Thursday, February 21st! Upon graduating from Cornell University, Eric worked in San Francisco’s vibrant restaurant industry for several years before following the call to work in the wine industry. A former trade sales director for Robert Sinskey Vineyards and the Bespoke Collection, Eric now directs trade business for Rhys Vineyards. Eric holds a diploma with merit from the Wine and Spirit Education Trust (WSET) and is a certified WSET instructor. The dinner will begin promptly at 6:00pm on Thursday, February 21st. The cost per plate is $150, including wine pairing, but excluding tax and gratuity. The menu for the evening will be posted shortly. Reservations for the evening may be made by calling us at 831.423.2020. *menu subject to change based upon availability. Guests may choose from one option for each course. Reservations can be made over the phone, or through OpenTable. The tasting will take place in the Soif wine shop from 5pm to 7pm. The cost of the flight is $15 for the general public, and free for Soif wine club members. Tickets may be purchased online or in our retail shop. New Year's Eve at Soif! Come celebrate this New Year’s Eve with good friends, amazing food, and incredible wines & cocktails at Soif! We will be serving a five course prix fixe menu at $125 a plate (not including tax and gratuity), with the option to include wine pairing for each course, at an additional cost of $50. The menu for the evening may be viewed below*. Reservations are required and may be made online through OpenTable or over the phone at 831.423.2020. When reserving your table for the evening, please let us know if your party has any dietary restrictions, so that we may be best prepared to accommodate them. Limited seating is available for this event, so we encourage you to book your table soon! The tasting will take place promptly Saturday, December 15th at 2:00pm. The cost of the tasting is $20 for general admission and free for Soif wine club members. Tickets may be purchased online, or in our retail shop. 'Tis the season for Champagne! Join us Saturday, December 8th, for a special holiday champagne tasting with wine expert and champagne connoisseur Hiram Simon. The wine selections for the event will be posted soon! The tasting will take place in the Soif dining room, at 2:00 PM. The price of the flight is $30 for general admission , and $10 for Soif wine club members. This is one of our most popular tasting events of the year, so we strongly encourage you to reserve your spot by purchasing tickets in advance, either online or through our retail shop. What’s better than starting December off with the first piece of chocolate from and advent calendar? Starting it off with chocolate AND wine! Join us for a special chocolate and wine pairing seminar, featuring the creations of Mutari and White Label Chocolate. We will be pairing several of their bars, confections, and baked goods with a variety of different wines. The tasting menu for this event will be posted soon! The tasting will take place in the Soif dining room at 2:00 PM. Cost of admission is $30 for the general public, and $10 for Soif wine club members. Tickets may be purchased online, or at the event. Holiday Wine Fair at Soif! Give the gift of wine this holiday season! Sunday, November 25th, we will be hosting a special tasting - tailored to help you find the perfect wine for all of your gift giving and holiday party needs. 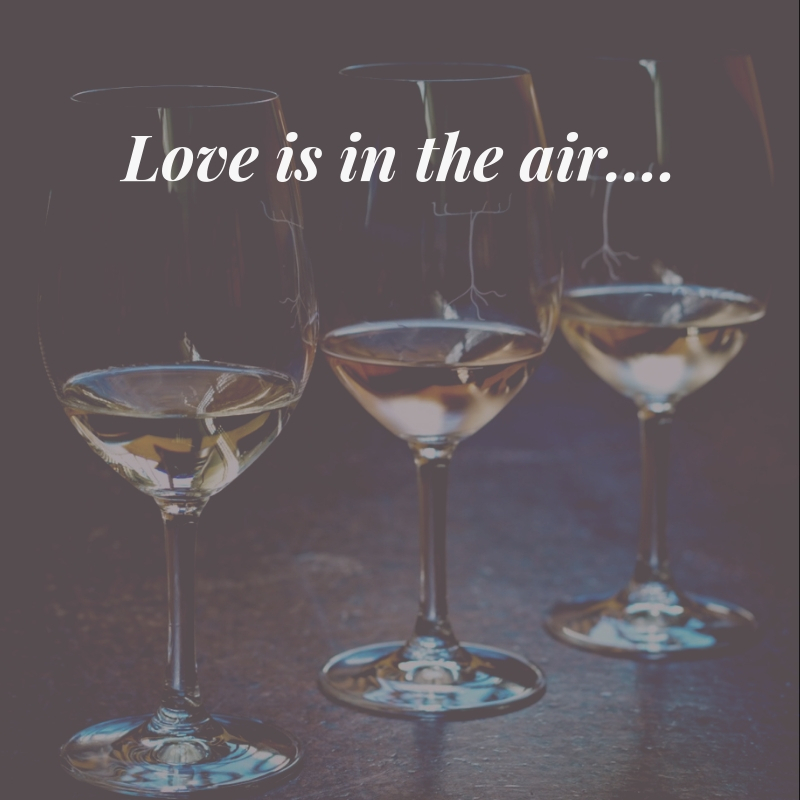 We will be pouring over 30 different wines from all over the world to taste; including selections from: Kermit Lynch, Northwest Wines, Chambers & Chambers, Martine’s, Vinity Wine, Charles Neal Selections, and Henry Wine Group. The tasting will take place from 1:00pm to 3:30 pm. Cost of admission is $10 for Soif wine club members, and $20 for General Admission. Tickets may be purchased below, or at the event. 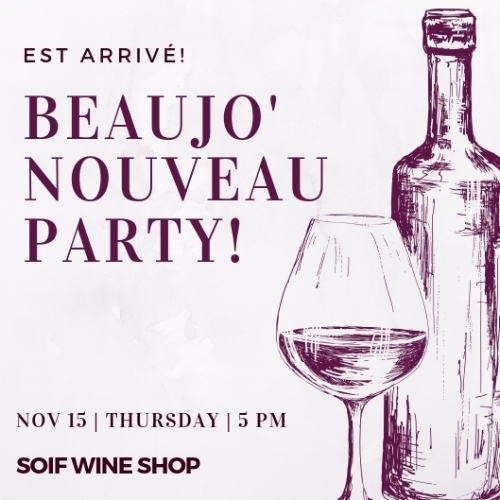 It’s almost time for the annual Soif Beaujolais Nouveau Day Party! The French holiday ‘Beaujolais Nouveau Day’ takes place every year on the second Thursday of November, and celebrates the release of the first wines of the season. Our Beaujo’ Nouveau Party is one of our biggest parties of the year, and we can guarantee that this is an event you won't want to miss! We will be pouring a number of this year’s nouveau style wines, as well as several other cru wines from Beaujolais. The cost of the flight is $15 for general admission, and free for our Soif wine club members. You can purchase your tickets (don't forget some for your friends!) online or in our shop. Soif is pleased to welcome Master Sommelier Peter Neptune as host for a November 8 dinner paired with Northern Italian wines! The cost of the dinner, including wine pairing, is $150 per plate**. The dinner will begin promptly at 6:00pm. Reservations for the event may be made by calling us at 831.423.2020. In order to provide the best possible experience, our restaurant and bar will only be offering the prix-fixe menu this evening. 'I Voted!' Party at Soif! Your midterm vote counts at Soif on Tuesday, November 6th. Just bring in your ‘I Voted’ sticker (or other proof) to receive special deals on food and drinks from 5:00pm to 9:00pm. We will feature two special election cocktails, ‘The Bitter Liberal’ and ‘The Elephant in the Room,’ select discounted wines, and a special bar menu. Perform your civic duty and treat yourself at Soif! Join us Saturday, November 3rd for a special flight of wines from Fossacolle! Stefano Bambagioni (winemaker and brand ambassador for Fossacolle) will be joining us to provide greater insights into both his family’s estate and our wine selections for the evening. The flight will be offered throughout the evening in the restaurant, as well as in the wine shop. Chef Tom McNary will also be including several dishes on the menu this evening, that are tailored to the Fossacolle wines being poured. Further information on Stefano Bambagiono and Fossacolle may be found on the Fossacolle website. Reservations to dine with us may be made online through OpenTable, or by calling Soif at 831.423.2020. The tasting will begin promptly at 2:00 PM. Cost of admission is $20 for the general public, and free for wine club members. Tickets may be purchased below, or in the wine shop. The event will take place from 5pm to 7pm in the Soif wine shop. Cost of admission is $20 for the general public, free for Soif wine club members. Tickets may be purchased below, or at the event. Further information on Veuve Fourny & Fils and their wines may be found on their website. The event will begin at 6:00 PM, and will include passed apps with each Champagne tasted. Cost of admission is $50 for the general public, $30 for Soif wine club members. Tickets may be purchased below, or in the Soif wine shop. Only 35 spots are available, so we recommend inquiring about tickets early! The tasting runs from 5pm to 7pm. Cost of admission is $15 for the general public, and free for wine club members. Tickets may be purchased below, or in the wine shop. Monday, September 17th, we will be joined by Valentina Davide, brand ambassador of Noelia Ricci, for a tasting of the Ricci family's wines. Noelia Ricci is a 9 hectares wine project founded by Marco Cirese (Noelia Ricci's grandson) in 2010. The Noelia Ricci vineyard is located within the estate of Tenuta Pandolfa (the estate is currently owned and managed by Paola Piscopo, Noelia's daughter). Spanning over 140 hectares at the foot of the Tuscan-Emilian Apennines, areas of the estate's lands are ideally located for the production of Sangiovese. Noelia Ricci, the namesake of the brand, was the first to realize the potential for wine on her family's estate. She began planting new vineyards in 1980's, and in doing so, laid the groundwork for the Noelia Ricci project. The tasting will take place from 5:00 pm to 7:00 pm on Monday, September 17th. Cost of admission for this event is $15 for the general public, and free for Soif wine club members. Tickets may be purchased below, or at the event. The tasting will take place from 5:00 pm - 7:30pm, Thursday, September 13th. Cost of admission is $20 for the general public, and free for Soif wine club members. Tickets may be purchased below, or at the event. The tasting will be held in the Soif wine shop from 5pm to 7pm. Cost of admission is $20 for general admission, free for wine club members. Tickets may be purchased at the event.